Dwelling in mountains, caves, even in isolated rocks, these creatures of Norse and Scandinavian folklore, are rarely helpful to human beings. Most often nightmarish in physical description-- they can be hostile and mischievous. It is a belief that lightning frightens trolls away and that the din of church-bells causes trolls to leave for other lands-- this is meant to explain the absence of trolls in many of the Scandinavian regions. 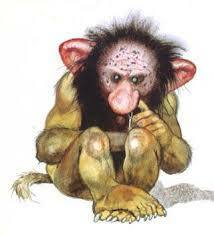 Then there are the Stone-Trolls, like the ones from Tolkien's The Hobbit, who turn to stone in sunlight. From childhood, I can remember hearing/reading the old fairytale, Three Billy Goats Gruff, with the goat-brothers trying to cross the bridge to greener fields. Only, they have to contend with the Troll that lives under the bridge--- he didn't ask them to cross his bridge, he didn't seek them out... 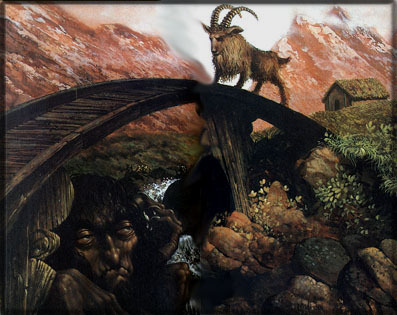 I always felt a bit sorry for the Troll, who was only protecting his bridge-home--- and perhaps looking for a tasty meal. and what, for you, they have in store. sounds strangely like your name. wake not, the sleeping troll.